One of Maui Land & Pineapple Company’s (ML&P) greatest initiatives is perhaps the Pu‘u Kukui Watershed Preserve. Pu‘u kukui means “hill of enlightenment.” It is the summit of Mauna Kahalawai, the West Maui mountainside that forms a backdrop to Kapalua Resort. 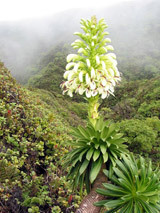 It is home to plant and animal species that exist nowhere else in Hawai‘i, let alone the rest of the world. It’s also one of the wettest spots on earth: Pu‘u Kukui is a natural watershed on which Kapalua Resort and most of the West Maui community rely for water. Established at the behest of ML&P’s visionary president, Colin C. Cameron, in 1988, the designation of Pu‘u Kukui Watershed as a management area recognized the need to effectively manage and protect the natural resources of ML&P’s conservation lands. Shortly before his untimely death in 1992, Cameron and Maui Land & Pineapple Co., Inc., granted to The Nature Conservancy of Hawai‘i a permanent conservation easement of 8,304 acres, creating the largest private nature preserve in Hawai‘i. A decade earlier in 1978, Honolua Bay and Mokule‘ia Bay, situated within the company’s landholdings, were designated a Marine Life Conservation District. This designation helped establish ML&P’s makai stewardship program, which monitors the coastline and coral reef ecosystems that provide both recreation and sustenance for Maui’s visitors and residents. ML&P employs five full-time conservationists, who care for 11,611 acres of conservation-zoned land, both mauka and makai. The acreage represents just over 50 percent of ML&P’s landholdings in West Maui. ML&P’s commitment to conservation expanded further in 1998, when the company became a founding member of the West Maui Mountains Watershed Partnership. This partnership coordinates conservation efforts of the private and public landholding entities of Mauna Kahalawai (West Maui mountains), allowing for management of natural systems regardless of property boundaries. 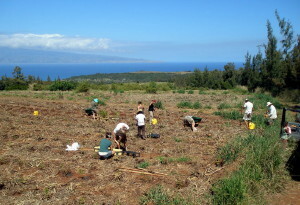 Honolua Wao Kele Native Plant Reforestation Project is a grass-roots effort to restore native plants and trees to former pineapple field lands.